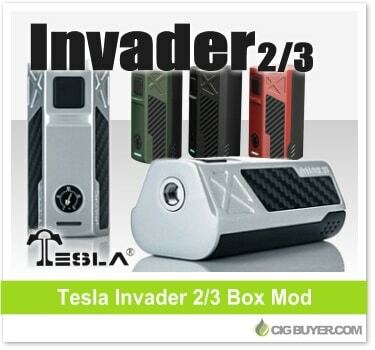 The Tesla Invader 3 Mod has has gone through a major revamp, with the latest version – the Tesla Invader 2/3 Box Mod – allowing you to use either two (240W) or three (360W) 18650 batteries, providing enormous power (or battery life) capability. It still uses the same adjustable potentiometer dial rather than an OLED screen and includes various built-in protections, but with three 18650 batteries it offers up to 360W! It has a sleek zinc alloy body with carbon fiber accents, LED indicator, oversized fire button and sliding battery access door.